I am a sailor. I started at sailing camp at the age of 10. I competed in Lasers during high school and as a varsity sailor in college. I went on to teach and coach the sport to children and adults. My current sailing endeavors include crewing on a J/22. Along the way I became a clinical and sport psychologist. I have now taken on my most challenging role, being a parent of a child who is interested in sport, including sailing. If you are reading this, there is a good chance you are a parent who enjoys the sport of sailing and wants the best for your child, whether that means simply learning how to sail, or competing in sailboat racing. 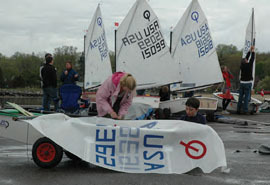 Sailing is a skill that, when taught at a young age, can become a lifelong sport and hobby. While parents want their children to succeed, providing guidance can be challenging and there is never one right answer. I hope these recommendations will help you build a strong foundation for your youth sailor, not only for competing at a high level, but also to develop a lifelong enjoyment of sailing. Sport psychologists agree that sport participation can help children learn important lessons, however, they also agree that it is not the sport itself, but the people who surround the child in the sport, such as parents, coaches, teammates, competitors and administrators, who build character in our children. Building a foundation for excellence as an athlete and as an adult, in many ways, can take the same path. In fact sailing provides a great analogy for this process of development. If you think about a day of sailing, many of the decisions you make as you get ready and sail to your destination are similar to raising your child. First, you choose where you are going, and gather information about the weather, the current, the time you have and the distance. Similarly setting goals, deciding where you are going and what is important while thinking about what is realistic for your child factoring in his or her abilities is an important step. You pack all your gear for the day, selecting what is necessary for a day sail, just as your child builds his abilities and skills that are consistent with his goals as a sailor. You decide who is going to take the tiller, and as the parent you decide when to let your child steer or when it is best that you take the helm through a narrow channel. Just as you provide guidance and rules for your child, parents need to know when to let their child be independent and when he needs you to intervene to provide guidance. The skipper constantly adjusts to the breeze by looking at the tell tales and trimming the sails, adjusting to the environment so that the course is maintained. Parents need to do this with their child in sport as well, knowing your child strengths and weaknesses as they grow and change is important as you provide guidance through all of life’s headers and lifts. Finally arriving at your destination, whether it’s an anchorage and picnic lunch, or a national regatta, requires all of these steps. I remember teaching at J World, a sailing school for adults. The owner of J World, an experienced sailor and educator, instructed us to stand near the stern so at any moment we could nudge the tiller with our foot to avert a crisis. We always started the weeklong instruction standing right near the tiller, but as the week progressed, we could move farther away, always staying within reach of the tiller. In so many ways this is what we do as parents, allowing our children to slowly have more independence, to steer their own boat, always ready at any moment to provide direction and get them on their course. I know parents who have planned for a day sail, but forgot to check the weather, only to end up in a storm, soaking wet without ever reaching their destination. While there are lessons to learn in those types of experiences, they may not be much fun. Ultimately research supports that the more enjoyment a child has in sport, the more likely they are to continue in the sport, play harder and have more success. 1. When my child is 21 years old, what kind of person do I want him or her to be, and how will sports help us, as parents, get our child there? 2. What are the three most important virtues or lessons that I want my child to learn through involvement in sports? If you have answered these two questions for your family, you have built a foundation to help your child not only learn how to sail well, but to also learn life lessons that will serve them beyond the water. For example, your 12-year-old daughter comes home from sailing after her first week of summer sailing, and asks if she can be part of the traveling team. To answer this question you may try to see how this decision fits with your values of compassion, honesty and pursuit of excellence. Can being part of the traveling team build these values and how as a parent can you ensure those values come first? Let’s say as a parent you decide it does fit with your family mission and you decide to let her travel. After her second regatta, she comes to you because the girls on the race team are not as friendly to her as her friends from summer camp. What will you say? How will you guide her decision to stay on the team or to go back to the-learn-to-sail program? Alternatively, what if your son comes home from sailing one day and says he wants to quit because he keeps coming in last around the buoys. How will you provide guidance? Is doing well in racing the only reason you continue to sail? Having a family mission statement may help your daughter and son cope more effectively with the challenges they will face. When you build a family mission statement, decision making becomes more meaningful. Jessica Mohler is a clinical and sports psychologist, and a sailing mom too. Feel free to contact her atJessica.Mohler@gmail.com. This article was originally published on the US Sailing blog (ussailing.blogspot.com/2011/06/developing-youth-sailors-what-parents.html) and is reprinted with permission. « Junior sailors: Don’t miss the Good Luck USA Olympic and Paralympic Send-Off presented by Maclaren!